My mother’s first words when I told her were ‘Oh no, not again! But you’ll have to go through the same thing, so soon!’ No, I wasn’t re-sitting an exam, or re-writing a chapter of my novel after a computer crash. I had just told her we’d decided to adopt a pair of older dogs. Considering we had not long recovered from having to put down our previous old girl, Cassie, she was quite within her mother’s rights to protest. 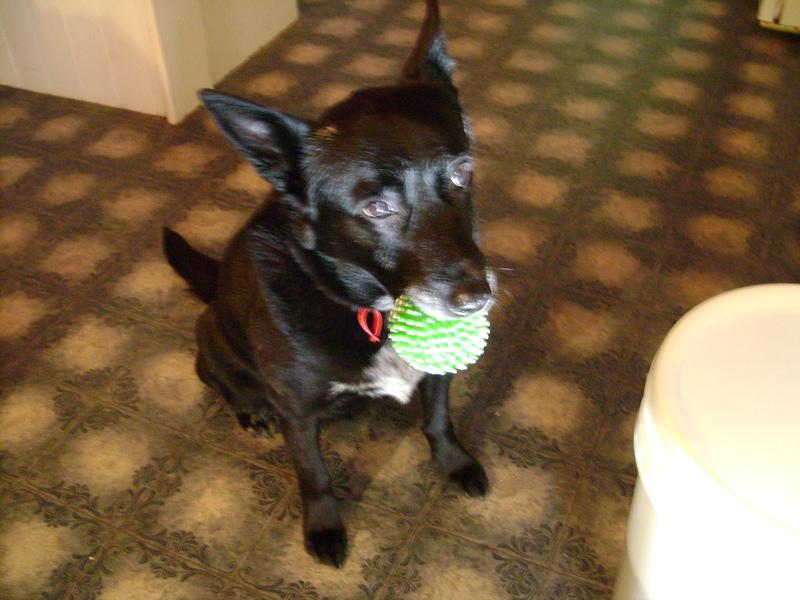 We’d adopted Cass thinking she was a lively nine year old Kelpie x Border Collie. On studying some paperwork, she was closer to twelve. But we had a lovely two years with her – my husband had never lived with and loved a dog before. She had him wrapped around her black paw from first meeting, when she ran off to find her favourite yellow ball to present to him. But she developed a heart condition, and after a year of medication and care, we witnessed her suffer a heart attack; and made the near-impossible decision to have her put to sleep the next day. Anyone who’s been through that knows how heart-rending it is. But the look on her face after that awful moment let us know we had to do it. We couldn’t be with her all the time, and we couldn’t possibly let her suffer another attack alone – the vet said more (and worse) would soon follow. He came to our house and we were with her the whole time, telling her how much we loved her. I can’t write this without a sob. But that is part of living with animals. Perhaps as a way of recovering, after several months I started surfing pet adoption websites. I knew I was flirting with danger, and I didn’t tell my husband for some time. It was like a guilty pleasure mixed with a feeling of ‘too soon, too soon’. But all I could think was that we had a chance to give another animal a happy loving home. Except this time I upped the ante, and went searching for two dogs who couldn’t be separated. Preferably older, since they had less chance of adoption. Yeah, I know. Glutton for punishment and all that. But eventually I confessed to hubby and the search was on in earnest – while he wasn’t entirely comfortable, so soon after losing Cass, he didn’t say no, either. I saw a few pairs of dogs who weren’t suitable for various reasons, mainly that they didn’t get along with cats (we have two cats we’d adopted at a few months old – they’re not related but live happily together). I kept going back to a pair of dogs, rightly nicknamed the odd couple. 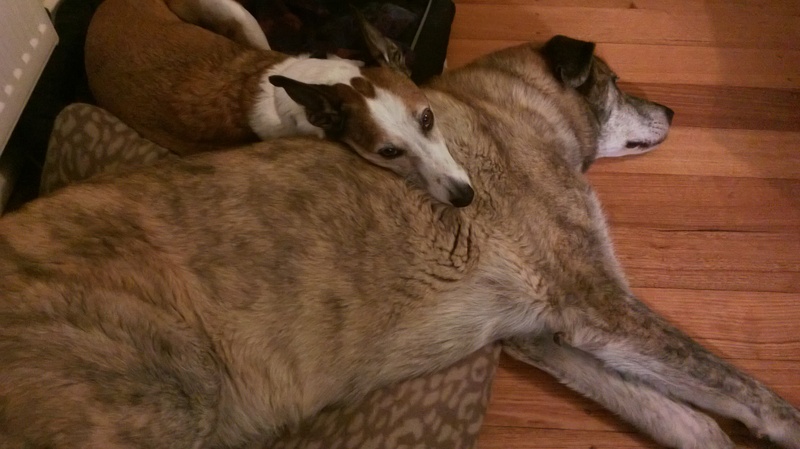 Matilda (Tillie) and Elvis were a mismatched pair in that Tillie the girl is a huge, furry 45kg cross-breed (possibly Malamute/Mastiff/German Shepherd) and Elvis the boy is a handsome little Whippet/maybe Jack Russell about 1/3 her size! They’d been together for about 6 or 7 years and their previous owner didn’t want them separated, so the wonderful Sunraysia Animal Rescue Group (SARG) cared for them for 18 months (with very patient foster parents! ), refusing people who only wanted Elvis because he was small & cute & younger. So us suckers from the big city came along & fell in love, driving them eight hours home from Mildura to Melbourne in a little old Corolla. Over a year later, we’ve survived some hiccups with walking (they’re boisterous with other dogs, to say the least!) and the cats have them well under control, and we’re in love. Again. All I can say is that it’s worth it – we don’t have kids, but we have a big backyard and neighbours who love animals, and we love the welcome home and the silliness of two dogs playing together, and the comic relief of a small cat stopping a playful large dog in her tracks with one little hiss. If you’re in the market for a pet, take a look around the amazing rescue groups and rehoming organisations out there – don’t give your cash to backyard breeders or dodgy pet shops. Make a home for all the ‘unwanted’ animals that are out there now – you’d be surprised who’s waiting for you! This entry was posted in Animals and tagged animals, dog adoption, Dogs, Older pets, Pet adoption. Bookmark the permalink. Beautiful. I have two dogs that just don’t get along, but both are wonderful. Here is what my son wrote about our older dog, Weaver. Thank you! It’s good that you work through them not getting along – it would be hard work sometimes 🙂 Sorry, your website link didn’t work, not sure why! Check this now. He has been blogging a lot longer than I have and he is migrating to a self-hosted site this week.